Dutch painter. 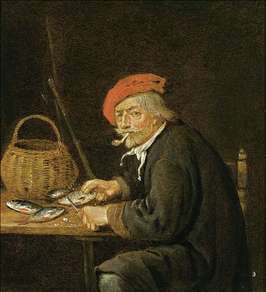 He probably trained in Leiden, possibly under Gerrit Dou. 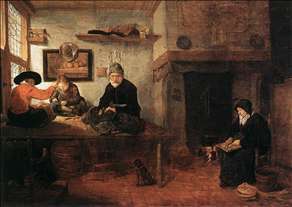 In 1648, with several other painters, he founded the Guild of St Luke in Leiden. He married for the first time in 1648 and again in 1656, a year after his first wife s death. 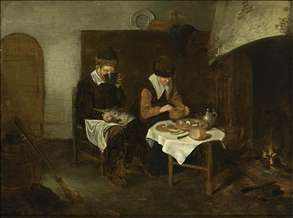 In 1649 his sister Aeltge married the painter Johannes Oudenrogge (1622-53), and the couple soon moved to Haarlem while the Brekelenkam family remained in Leiden. 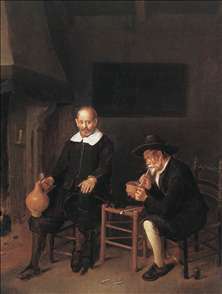 About 1656 Brekelenkam apparently acquired a licence to sell beer and brandy, perhaps because his income as a painter was insufficient to support his large family (six children from his first marriage and three from his second). He continued to be active as an artist and paid his guild dues fairly regularly. The last dues were paid in 1667, and his last dated painting, the Portrait of a Man Aged 33, is from 1669. 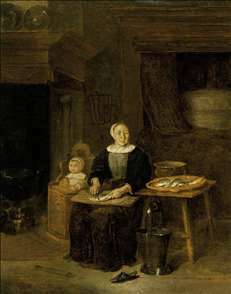 See more details about "A Couple Having a Meal before a Fireplace"
See more details about "Man Scaling Fish"
See more details about "A Woman Scaling Fish"
See more details about "Interior of a Tailor's Shop"
See more details about "Interior with Two Men by the Fireside"